The tennis season is full swing (excuse the pun!) and Wimbledon promises to be the usual sporting spectacle. With many of us reaching for our racket it’s important to remember, as we’ve seen with Andy Murray, even the top tennis players get injured. It’s no wonder then that so many of us hobble off the court with some kind of tennis-related injury. In a series of blogs we’ll be looking at some of the most common tennis injuries, how the occur and importantly how to prevent them. In this first article we’re going to focus on back pain. To understand why these may occur we need to look briefly at the bio-mechanics of tennis. High ball velocities and racket positioning place significant loads on the muscles and joints of tennis players. To minimise the load to each joint and the associated muscles, a player must make efficient use of the kinetic chain. 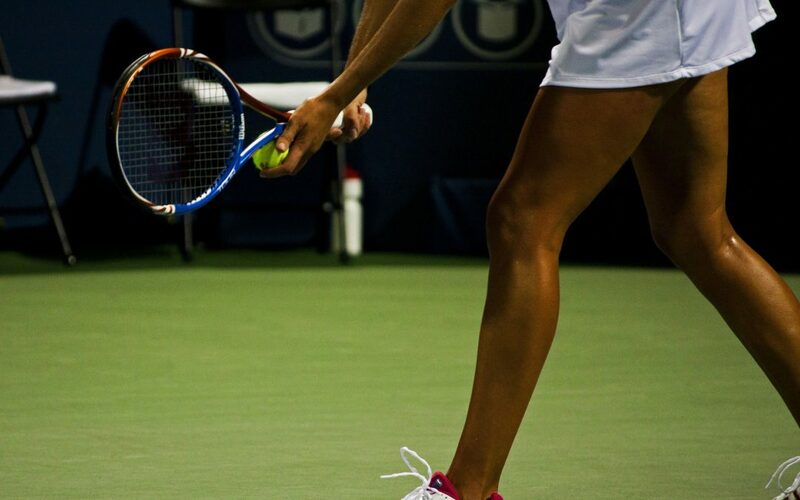 In tennis the kinetic chain starts with the feet and knees and travels from the lower extremity through the trunk and back to the shoulder and elbow, ending at the wrist, hand, and ultimately the racket. The serve, in particular, creates significant musculoskeletal demands. In simple terms the serve has four phases: preparation, wind-up, force-generation and the follow through. The greatest demand occurs during the wind-up phase, where players perform trunk hyper-extension (backwards bending), lateral flexion (side bending) and rotation movement. Although this allows for greater storage of elastic energy for the acceleration phase (think of the body like a wound-up coil in this position), it can place great stress on the spinal structures, and it is this movement that is thought to be the main causative factor for back pain in tennis players (Correia et al. 2016). Breakdowns (muscle weakness or joint restrictions) at a given point in the kinetic chain can result in injury at that point or manifest as an injury further down the chain. In fact, a recent study by Campbell et al. (2014) compared the three-dimensional lumbar spine, pelvis, trunk, lower and upper limb kinematics during serve, between tennis players with and without a history of low back pain. There were significant differences between players with a history of back pain and those without, for example players with back pain had less pelvis and shoulder rotation suggesting this may be the cause of their back pain. Recognise symptoms early – if pain and swelling occurs seek advice, and book an appointment with one of our registered osteopaths in Clapham. Unsure what specific stretches and movements you should be doing? Book an appointment with one of our registered osteopaths who will be able to perform a movement analysis and identify factors that may predispose you to injury and prescribe a tailored prehab / warm up routine for you. Unsure of what strength, balance, co-ordination, proprioceptive, sudden movement, and plyometric drills you should incorporate into your training regime? Our Personal Trainers are here to help!